Workplaces remain hotbed of possible flu contagion, despite recommendations that people get their vaccinations. Even an ordinary seasonal flu epidemic will still kill several thousand people every year in the US alone. This year’s flu, which the Centers for Disease Control and Prevention estimates caused more than 125,000 illnesses since the beginning of the season, shows no sign of abating. 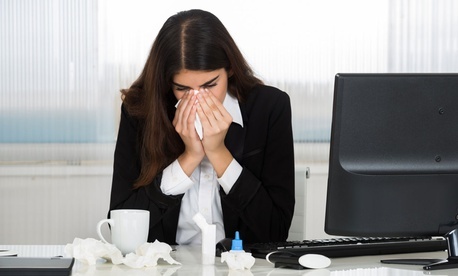 Nellie Brown, a certified industrial hygienist and director of Workplace Health & Safety Programs at Cornell University’s School of Labor and Industrial Relations, offers tips on how to minimize the potential for virus spreading at the office. Did you touch the stapler? “Think about what you touch in and out of the office. Did you use an ATM? Did you put gas in your car? If you were in a conference room—did you touch the table and chairs at the meeting? Did you borrow a stapler? Did you go to the water cooler and touch the handle? We touch a lot of things in common and that’s how diseases are spread. How to contain germs: “Clean with germicide. In order to prevent the spread of germs, clean surfaces with an EPA-registered germicide that kills influenza. Do a thorough hand-washing with regular soap and wash your hands more often. If you use a tissue, throw it away. If you are headachy and stuffy, watch your sneezing etiquette—when you cough or sneeze the droplets can spread easily six feet. Don’t be a hero: “Stay home. People with the flu should be instructed to not report to work. With the virus being contagious, it’s best to have employees with the flu stay home. If you are achy below the neck, exhausted, or feverish, your body is saying you need to rest—so listen to it.